For the past week, I embraced the archaic and seemingly out-of-date idea that my man is the sole breadwinner and goes out to work, (minus the pipe and newspaper under his arm) while I stay at home. Instead of sweating over invoices and articles to edit, I enjoyed cleaning, cooking and spending a good amount of time making myself pretty for when he comes home. I washed and dried his clothes, made the house sparkle, and made sure not only a nutritious and delicious meal was prepped and cooked, but also a bountiful supply of muffins, cakes, and all other sugary and buttery delights were standing pride of place. This week off threw me back to the fifties, and I wanted to stay in my time-warp…. What, however, is so wrong with this? Why did I feel this is something to feel guilty about? I love that I have the vote. I adore that I can have my own career, wear what I want and have a say in society. I am proud of my education, my ambition and the ability to drive. I like having my own money, paying bills and being a fully fledged self-sufficient adult. 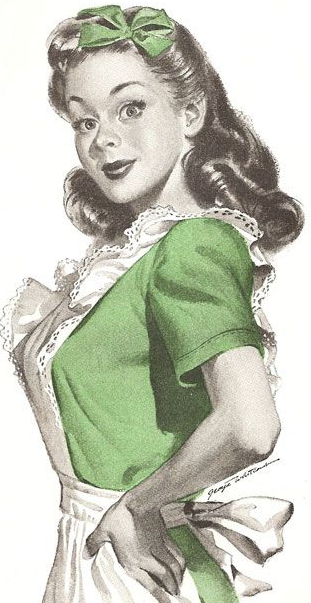 But I also have become besotted with the idea of being the lady of the house, greeting my man in a pretty apron, a bow stuck to my head and printing a perfectly applied Cupid’s bow kiss on his cheek when he comes through the door. No one could however disagree with how fabulous the fashion, the make-up and the hair were in the fifties and this spurred on my dreams throughout of being a perfect housewife, if Audrey Hepburn can look glam, so can I.
I have become the Kirstie Allsopp of my social circle. I’m baking, cleaning, cooking and decorating the house with all the vigour of a woman let loose from a tasteless and ugly prison. I’m appliquéing sausage dogs to homemade draught excluders for Christ sake. But I love it, and this past week, back to the humdrum of my normal life, I miss it. Googling some advice for the perfect fifties housewife however, I found that I was severely lacking in that department. My assumptions for what was considered to be a ‘perfect’ housewife were wrong, instead the housewife’s duties were not only incredibly demanding, but also reaped little to no reward. Because unlike the modern and contemporary man that I have sat opposite me who tackles the bins each week, the fifties housewife didn’t have that. Their man’s role was to work, to come home, slip on his slippers, eat his meal, and bestow his wife with little to no time of personal contact unless it was the obligatory marital obligations once a week. Their list of daily chores spanned around 3 hours a day and unless they had aid with the children in the form of a nanny, they also had to single-handedly raise them. Not an easy feat. However, one article did elude the fact that often these women were tough, ultra-organised and had the handle of their partners pay packets giving THEM pocket money instead of the other way round. I’m a straight up nag. I love people, I love my boyfriend, I love my friends… But I do nag. This would definitely be the hardest thing to adopt out of my check list. Nagging makes me feel mean, rude and above all boring, it also doesn’t make a difference to the person and if they do something. Although the hardest thing to change, maybe this is the best one to adopt… Revelation! The housewife and the workaholic…. Can these two women however co-exist in society, or better yet in my life? I’m organised, career driven and am living in sin with my boyfriend – a fifties housewife I am not. I can’t quite see myself donning heels and tottering (more like clomping) around my home with a feather duster while my wide hemmed skirt dusts the skirting boards for me, not nagging, and knowing my place under the master of the house… (and not in the good way). I can’t quite imagine finishing work and commuting home on a matchbox filled with the obligatory miseries and being in the mood to make sure I’m doused in rose perfume, my nails gleaming from my manicure and the house spotless after 3 hours of cleaning. The dinner I’m sure will be out of a packet, the salad being the only “homemade” adage, (yet straight out of a bag with a few tomatoes thrown in can hardly be considered as such.) The baking will be done by my dear friend Kipling and the jam will be kindly donated by a lady in France going by the name of Bonne Mamman. My lips will be in need of a good lip balm, my apron will be rolled up in a drawer somewhere, waiting for its next outing. It was fun for a week, and under my own insular assumptions of what a fifties housewife was. But after pondering and researching, the concept has become distasteful and intense. Instead, I choose happiness. I choose now, the present. I will have a lovely house to come home to, a man who is thoughtful and understanding and a career that is incredibly important to me. I will however make this promise, my sausage dog draught excluder will be finished, my baking will be honed and I may one day finally finish that knitting project that has kept me company this past year. I promise to devote an evening a week to the inner Kirstie in me and I promise this not only to myself, but also to my long suffering boyfriend, I promise you I will pop a bow on my head and greet you with a kiss everyday and maybe possibly, if you’re lucky take out the bins once in a while.